Ivonny Villarojo meets Department of Defense Secretary Delfin Lorenza at the DND Office. The cadet corps commander of the University of Bohol (UB) Reserve Officers’ Training Corps (ROTC) was chosen as the lone delegate from a Central Visayas school to join the Cultural Understanding and Leadership Program (CULP) in Guam, USA. Cadet Col. Ivonny P. Villarojo was among the country’s representatives who joined the rigorous training of the CULP, an international leadership program offered through the ROTC, held on November 13 to 19. 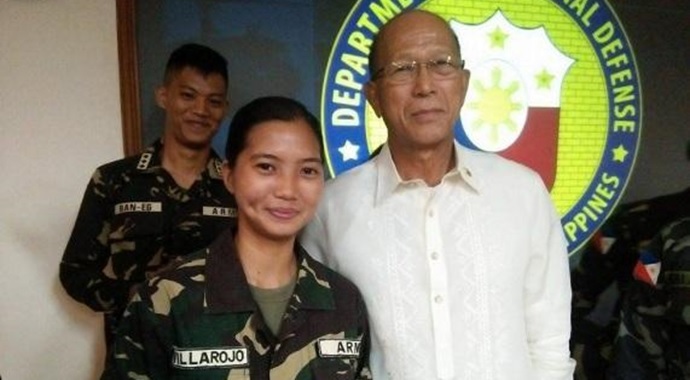 Villarojo, the lone representative of the 7th Regional Community Defense Group (7thRCDG), was one of the 22 ROTC cadets from the different branches of service in the country who joined the 27-strong Philippine delegation. The program, under the auspices of Guam National Guard, was geared towards enhancing culture and leadership awareness and strengthening partnership between the Armed Forces of the Philippines and the United States Armed Forces. At the start of the week-long training program, the Philippine delegates paid a courtesy call to Philippine Consul General to Guam Hon. Marciano De Borja. De Borja discussed the importance of mandatory ROTC in relation to the country’s economy and security. The delegates then underwent rigid strategic planning sessions, survival training and field training exercise.